Two new owl species have been identified in the Philippines, and researchers say the birds' songs led them to the discovery. "More than 15 years ago, we realized that new subspecies of Ninox hawk-owls existed in the Philippines," zoologist Pam Rasmussen of Michigan State University said in a statement. "But it wasn't until last year that we obtained enough recordings that we could confirm that they were not just subspecies, but two new species of owls." 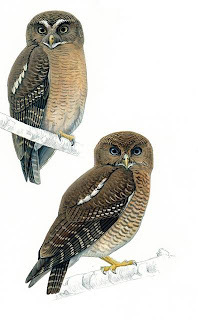 In fact, the researchers found that the Philippine hawk-owl (Ninox philippensis) consists of seven allopatric species, or those that emerge as a consequence of individuals being isolated geographically, or temporally. They also identified one subspecies. Two of the species had never been described nor officially named, until now. One of the newly identified owl species, now called the Camiguin hawk-owl, lives only on the small island of Camiguin Sur and has a very different voice and set of physical features than other owls in the region, the researchers said. It has blue-gray eyes and sings a long solo song at night that builds in intensity with a low growling tone. Pairs of Camiguin hawk-owls, meanwhile, sing short barking duets that kick off with a growl. The researchers, who reported their findings in Forktail, the Journal of Asian Ornithology, also identified the Cebu hawk-owl after studying its structure and vocalizations. "When we first heard the songs of both owls, we were amazed because they were so distinctly different that we realized they were new species. ""The owls don't learn their songs, which are genetically programmed in their DNA and are used to attract mates or defend their territory; so if they're very different, they must be new species," Rasmussen explained in a statement from MSU. I don't know the reason why I am unable to join it. Is there anybody getting the same RSS issues? Anybody who knows the solution can you kindly respond? Thanks! !